I cant tell you how happy I am to lead this organization!! This is awesome news! Diaper Need Awareness Week, celebrated each year during the last week of September, is an initiative of the National Diaper Bank Network (NDBN), created to mobilize efforts to help make a difference in the lives of the nearly 5.3 million babies in the U.S. aged three and younger who live in poor or low-income families. The Junior League of Daytona Beach, which is beginning its second year running the only Diaper Bank in Volusia and Flagler Counties has recently received the largest donation since its inception. Domtar of Fort Mill, SC, a pulp, paper and personal care manufacturer whose clients include Captial Office Products of Daytona Beach has donated 380,000 diapers of various sizes to the Junior League of Daytona Beach Diaper Bank. The donation was coordinated locally by Junior League member Amie Story, who works at Capital Office Products. Tom and Heather Patton, owners of Capital Office Products, donated warehouse staff time and storage space for the diapers. "Capital appreciates the partnership we have with Domtar / Enterprise group. Their generosity with a truck load of diapers will truly help support a variety of local charity needs." says owner Heather Patton. 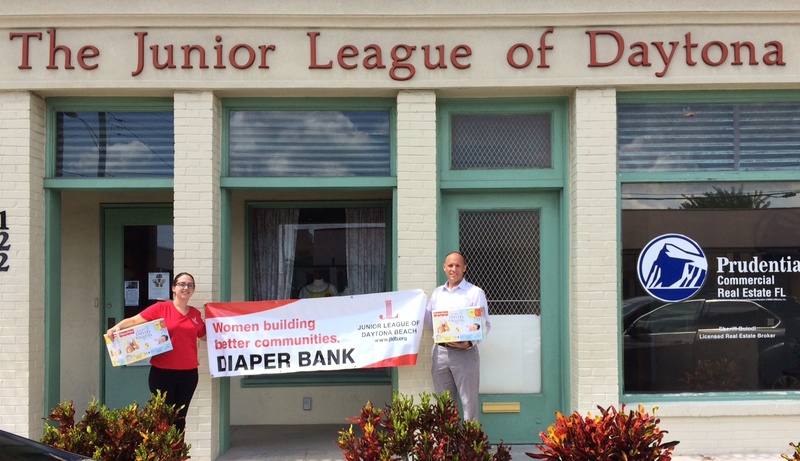 "Thanks to the generosity and donation of diapers and space from Domtar and Capital Office Products, the Junior League of Daytona Beach will be able to help so many more women and children in Volusia County than ever thought possible. This donation truly gives our Diaper Bank an opportunity to work on other areas to make this project an even bigger charitable success." commented Darlynn Tacinelli, President of the Junior League of Daytona Beach. The Junior League of Daytona Beach Diaper Bank is beginning its second year serving low income parents in the Daytona Beach area. One in three families struggle to purchase diapers which can cost up to $100 per child per month. This cost can be more than double when diapers are purchased from convenience stores, a common scenario for those lacking transportation to discount retailers. In its first year of operation, the Junior League of Daytona Beach Diaper Bank collected 32,102 diapers. League members work with local community agencies to reach low income parents for monthly diaper distributions.